Though the original motivation for satellite navigation was for military purposes, one cannot deny that it has now become a necessity in daily life. But few knows that one of the key parameters affecting the quality of satellite navigation lies in the ionosphere, a region of the upper atmosphere from 85km to 600km altitudes. PhD candidate LIU Guoqi with his colleagues from Center for Space Environment Research and Forecast (CSERF), National Space Science Center (NSSC), are trying to unravel the secrets in the ionosphere, especially in the near Equatorial Ionization Anomaly (EIA) crest location in China zone. The ionospheric impact on satellite navigation and communication is proportional to the free electron density. The variation of electron density could change the phase and strength of the electromagnetic radio frequency wave, inducing range error in positioning and navigation. Such range errors are relatively obvious in the EIA regions due to the high background electron density as well as the rapid and complex variation. Therefore, it is the top priority of the research team to grasp a prior and precise knowledge of the variation and the distribution of electron density in low latitude regions. 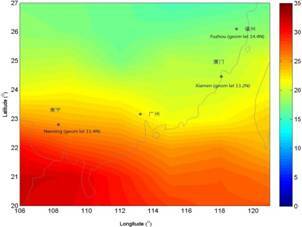 Applying data from three observational stations in Fuzhou, Xiamen and Nanning, the research team studied the characteristics of vertical total electron content (VTEC) during the low solar activity. Seasonal anomaly was found over the three observational stations and the biggest correlation coefficient was found in the VTEC-sunspot pair with a value of over 0.5. The results revealed that the ionospheric model overestimates the measured VTEC in the low latitude area. The research findings will help understand the variation of total electron content (TEC) around 110°E to 120°E near the EIA crest. And as an integral part of the global ionosphere characteristic, it will facilitate the study of constructing a more accurate model of the ionosphere. Center for Space Environment Research and Forecast, National Space Science Center.